Spring tides for the clockwise circuit of the Island and a good South Westerly. Started about mid line but bit late with the kite as we had to change to a starboard pole at the last minute. Managed to creep out into the stronger tide and pulled away from smaller boats as we headed up the Solent to the Forts. Headed inshore when past Ryde Sands inside No Mans Land but the wind started playing up as we approached Bembridge. Dropped the kite as the wind turned South Easterly and fell into a few holes as the majority of the fleet stayed further out. Eventually the gradient South Westerly kicked in from the North and we beat into the mark with Respect just ahead as they were further inshore and picked up the new breeze first. Once round the mark we tacked into the shore to rock hop to and out of the strongest tide. 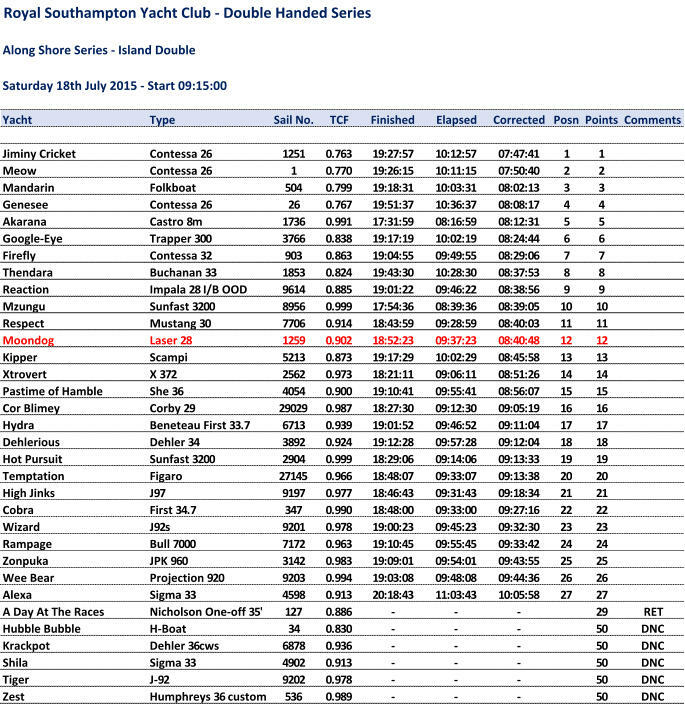 Went right into Sandown Bay and were nip and tuck with Respect with gains and loses on various crossings. Once round St Catherine's Point it was sheets eased to the Needles and got ahead of Respect who stayed further in. 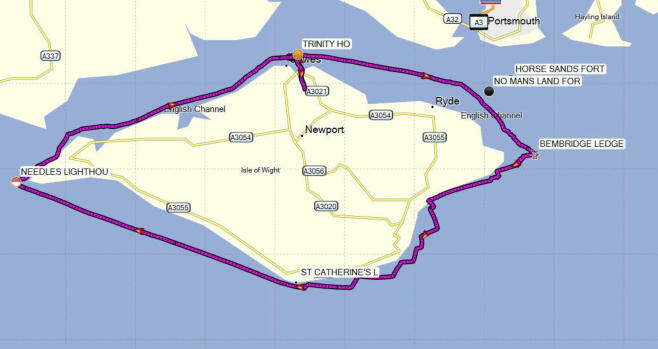 Inshore channel round the Needles with nothing less than 4.5m and then head back to Cowes against the strong tide. Got through Hurst fairly easily and passed Mostly Harmless who were aground just past Port Albert. Decided to rock hop up the Island shore with Respect who had come through Hurst just behind us going across to the Mainland. Kept out of the worst of the tide and thought we were making reasonable progress until we saw Respect crossing in front of us to finish 9 minutes ahead. Also managed to bounce off Gurnard ledge which certainly grabbed our attention. As expected we were beaten by all the lower raters as they finished behind us once the tide had turned.